James Herriot, a Scot who fell in love with North Yorkshire and worked here all his life, wrote best-selling books describing his adventures as a vet in the Dales and on the Moors. 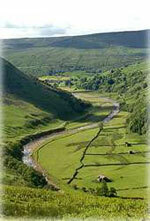 Wensleydale and Swaledale are the heart of Herriot country. They happen also to be two wonderfully beautiful Yorkshire Dales. This 4-day walk combines strolling in the valley bottoms with some energetic work on the skylines. It includes Great Shunner Fell, a genuinely high Pennine summit, where your navigation skills might well be required, so map, compass and whistle are essential items in your equipment.